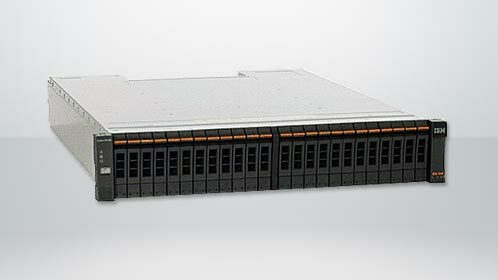 Running out of storage on your IBM Power System? An easy upgrade path to increase capacity is to add the IBM 5887 disk drive expansion unit. Capacity per drive can range from 300gb to 900Gb spinning drives and either 177gb or 387gb SSD. Configured many different ways, one of our most popular disk expansion projects is as follows. With this simple project you can significantly increase your raw storage capacity by approximately 7TB for a very reasonable price in the IBM enterprise market. – It is typically possible to install the 5877 with the system running if you are using a HMC, SDMC or if you have one partition and running the IBM i OS. – If it is required to move an expansion unit, the system must be powered down even if running a HMC, SDMC. EXP24S SFF Gen2-bay Drawer (#5887): The EXP24S is a high-density, high-performance SFF drive drawer, holding up to 24 SAS drives in 2U of 19-inch rack space. The EXP24S can also be ordered in mode 1, 2, or 4, providing additional configuration flexibility.